Brief note: I announced on Thursday that we’d be hosting a Crafty Meet-Up at the Whipstitch shop in Atlanta on June 29. Turns out that’s the Friday before July 4–who knew? Lots of you let us know that you’ll be out of town that weekend and were bummed you wouldn’t be able to make it–so we’ve made the decision to COMBINE the Crafty Meet-Up with our Skirting the Issue Sew-In on July 14. Which means the June 29 event has been re-scheduled. Just FYI–plan something else for June 29 for yourself, then mark your calendar to join us at the shop July 14, instead, and watch the newsletter for more details. Thanks, y’all! I hate to break it to you, but I can very nearly guarantee that you aren’t taking care of your sewing machine the way you should. I’m not picking on you–most of us aren’t, if we’re being honest. The good news is that it’s super easy and not even time consuming to take really good care of your sewing machine, and it will make your machine last longer and sew better. 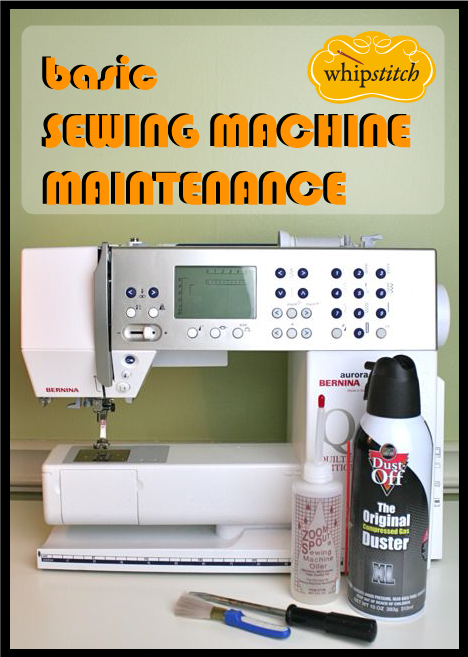 That’s right: simple maintenance will help your sewing machine do better work that you’re more satisfied with. If that’s not instant gratification, I don’t know what is. All this week, I’m posting about maintaining and cleaning our sewing machines, and I’ve got a little something for everyone: cleaning a machine with a bobbin case (commonly called a “front-load” machine); cleaning a machine with a top-loading bobbin; cleaning a serger; when and how to schedule professional maintenance on your sewing machine; and how to reduce those service visits with some simple tips. I’m super excited, mostly because this motivated me to get some cleaning done and that’s never a bad thing. Today, basic cleaning of a front-loading sewing machine, with a bobbin case. You’ll want some simple supplies on hand: a stiff-bristled brush, sewing machine oil, perhaps a can of compressed air, a screw driver for removing any screws that attach your throat plate to your machine arm, and some scraps of clean, soft muslin. Check out the video for step-by-step and plenty of patter. Wonderful video!!! I’m constantly cleaning out my bobbin case. It always seems to be so linty!!! I wish my throat plate popped out as easily as yours!! I took mine off once and a blob jumped out–I seriously thought it was a living organism and totally squealed like a frightened little girl. I’m much better at cleaning often now, though! WOW after reading this I feel like I’m lucky my sewing machine deals with me at all. Definitely need to take better care! Thanks so much. Keep writing! So excited about this! Can’t wait for the top-loading info! Thank you so much for doing this “series!” I have a Brother top load and have never taken the throat plate off! I have sorta cleaned it… I have never oiled it. Yikes! I’m eager to see tomorrow’s video! Hope that you have been doing well! Excellent information, thank you. I just finished doing this for the first time…it really needed it. I purchased a little vacuum attachment from Amazon ($10.) that goes onto my regular vacuum. It steps the intensity of the vacuum down and has some brushes etc. I had read that you could use canned air but for the reason you stated ( I was concerned that it might blow back into my machine) I went with the vacuum. Have you ever vacuumed your machines? If so what are your thoughts on it? I’ll make sure to catch this series! Such good timing, I just got a brand new Bernina! Thanks so much for this. I have often wondered about cleaning my machine and where to oil it. I didnt realize the frequency of the oiling either. Really helpful, you are a gem Deborah. This is SO HELPFUL! I thought I was oiling and cleaning my Bernina properly but I was barely getting done what I should. Thank you so much for this wonderful tutorial!